It's common to see that various kinds of metal detectors are made to be used for detecting objects or setting up inspection system on land, while in daily life the underwater inspection system can be rare to see. 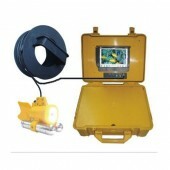 If you are interested in making a detection submarine or in a dark condition, you may need to know the detailed information about this professional submarine underwater inspection system with 7inch screen here www.detectorall.com to meet with your requirement of inspecting the mysterious underwater world. At first, designed with a 7 inch high definition color LED screen which costs low power and will not give out radiation and do harm to people's health, you can see the detecting result or the object you have found clearly during the usage of the waterproof metal detector. And the storage battery is used as the device’s power supply which is fast and convenient and also is rechargeable. You just need to change the battery when it indicates low power with less effort. The important feature of this underwater inspection system is the plastic box to stock this equipment, which is luxurious, portable, shockproof and waterproof. The metal detector is one of the precise instruments and needs to be treated carefully otherwise it may suffer from damage from outside environment. The box can act as the protection unit to prevent the possible hurt. What's more, this submarine inspection system with 7inch screen owns high definition low illumination CCD underwater camera, which has night vision function and makes it possible to work underwater in dark condition. This unique high power function can be very useful for the group of people who prefer taking adventure on the ground water exploration and will help them to find the object they want quickly and easily even the detecting area is in bad vision condition. This waterproof metal detector is mainly used for underwater monitor, underwater reconnaissitance, hydropower station, industry observation, ground water exploration etc. And because of the underwater camera it can also be used to examine the underwater holes, underwater operation, fishing etc. When it comes to choosing a place for metal detecting, there is a variety of options that can possibly generate metal detecting finds such as beach, river side, farmland field, historical sites and mountain sides etc. Even more professional underwater detectorists would like to dive under the sea in hope of finding treasure left from shipwreck. Just like gold hunting and common relics hunting, you had better choose specialized metal detector for each. Hunting in wet land and dry land is totally different issue, in which dedicated metal detector for each is required. If you try to find the best and professional waterproof metal detector for your good detection and want to get an enjoyable experience, a lot more issue will get involved and you may get the specific solution basically from the related website or just come to our store then you can get much knowledge of this device.